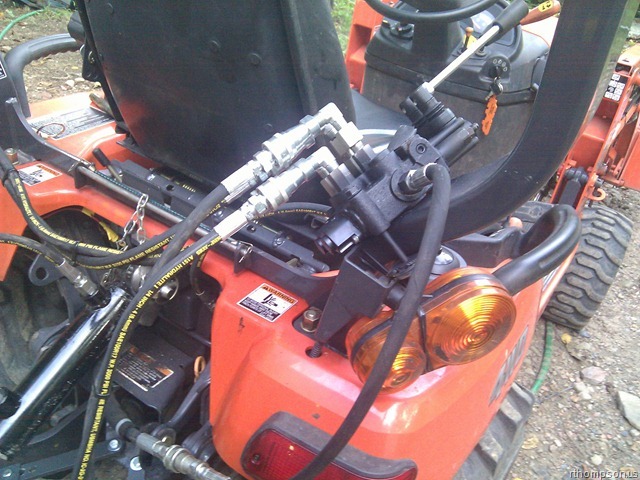 The Kubota BX24 is a pretty versatile machine. It is also pretty easy to add accessories on to. 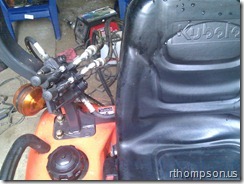 Here is how I added rear remotes and a top and tilt setup to it. The remotes will work with the backhoe on or off. I also have the parts list included so anyone else can add them to their machine. There are three lines where the backhoe connects to the tractor. They are the inlet, outlet, and power beyond. Since we want the remote to be last in line to make things simpler adding it to the power beyond port from the backhoe is the best way to do it. On the tractor the power beyond is the flexible line. The left hard line is the outlet that dumps directly into the tank and the right is the power beyond. The backhoe is the last thing on the hydraulic circuit so that power beyond port also dumps directly into the tank. Along with this you need to be able to fabricate a bracket to bolt the spools to the roll bar. It is a simple flat bar with 2 holes and some long bolts to clamp it to the bar in an easy to use location. I used the diagonal holes in the spool to attach it so the handles would stick out at a slight angle. I could have moved it up a bit further but that would require a longer hose than 18 inches on the return line. Assembly is pretty straight forward. Unhook the right hard line female coupler from the hard line and add the female to female coupler to it. attach the 18 inch line. Then attach it to the return line on the spool with one of the NPT to SAE adapters. It is best to attach that line before mounting the spool since the ends don’t turn and you will need to spin the spool on to the line instead of the other way around. Once that line is attached mount the spool down solid. The next line to attach is the power beyond line to the inlet of the spool. Just use the SAE adapter and the 24 inch line. 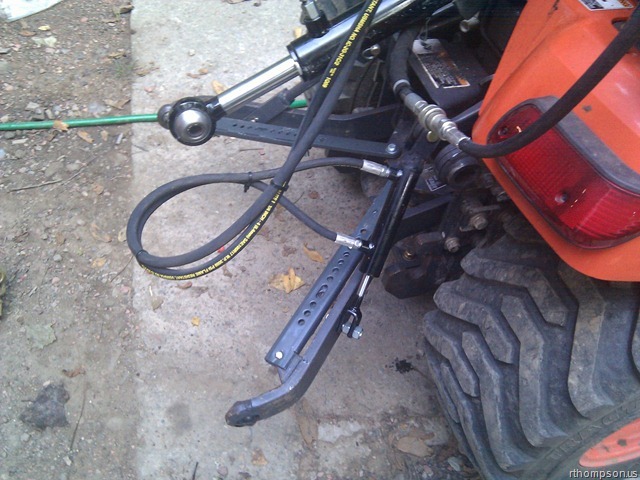 Put the coupler you removed from the tractor’s hard line on the end and connect it back like usual to the tractor. When the backhoe is attached the line is connected to the power beyond port of the backhoe. When it is removed the tractor’s power beyond port normally dumps straight into the tank but now it runs through the new spool before returning to the tank. Last step is to put the 4 SAE to NPT adapters into the work ports. The front two just get an elbow and a quick coupler end. The back two need the NPT to NPT spacer before putting the elbows and quick couplers on. This way the back ones are just above the front ones and it is easy to connect anything needed. That is it for the rear remotes. Now it is on to the top and tilt. here are the additional parts you need for it. The top link can be connected and used easily. It just needs a small amount ground off the sides of one of the swivel eyes to fit the tractor, I didn’t want the slack from the 7/8 pins in a 1 inch hole so I cut out some sleeves and drove into the swivel eyes, that isn’t required though and it will work fine without them. The side link is going to take some welding to get to fit. I cut the end off the link and welded the end of the stock side link to it so it would fit on the upper swivel eye. The lower link I ran a bolt through the stock hole and bolted the link directly to the side of the arm. 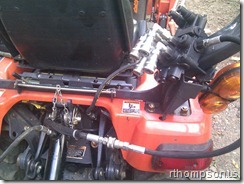 The top link and side link I listed do not have check valves in them so they are not the perfect cylinders. But they are the best ones I have been able to find for a reasonable price. If anyone finds anything better leave a comment here for everyone to see what to order. 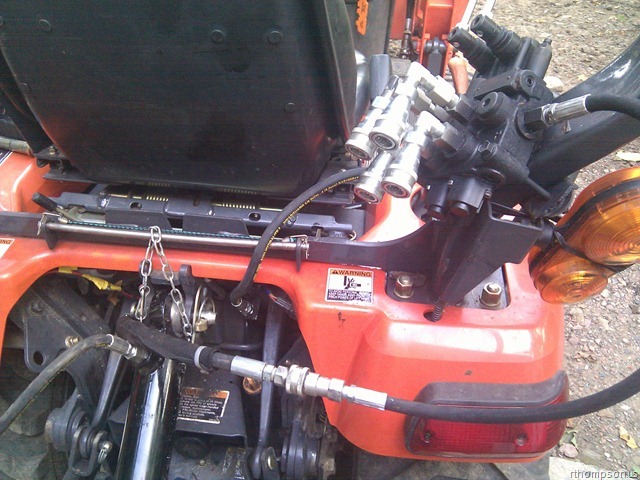 Also I replaced the horrible turnbuckle links with some other Kubota parts. They are easy to install. Just cut a notch out of the pipe section so it fits over the stock mounting hole. You can see it in the pictures clearly. 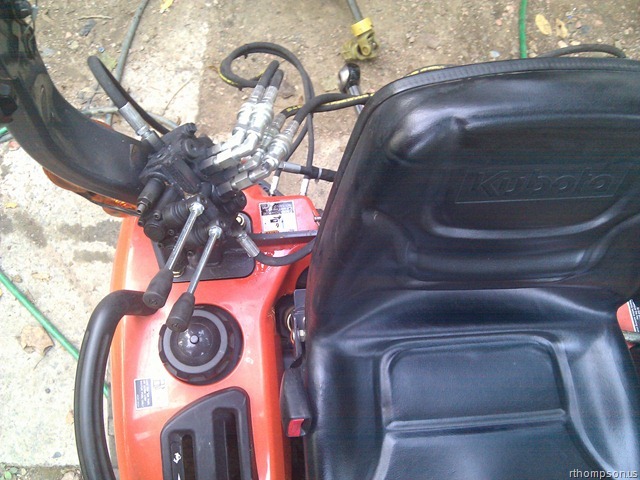 The Kubota part numbers are 6C070-65320; PIPE, STABILIZER and 6C070-65333; PLATE, STABILIZER you will need two of each. 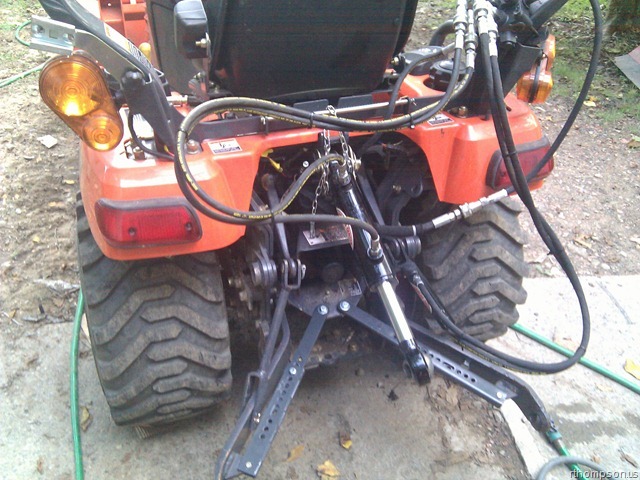 I ordered mine from http://tractorsmart.com since you can enter part numbers directly there. If you want to add any other spools or hydraulic equipment you must enable the power beyond on the Prince spool as shown in the instructions. Then the power beyond goes back to the hard line or to whatever secondary spools you hook up. 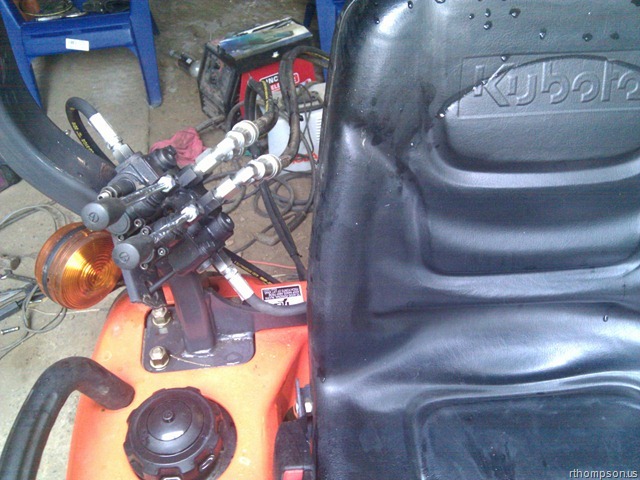 The tank line is the left hard line on the back of the tractor. 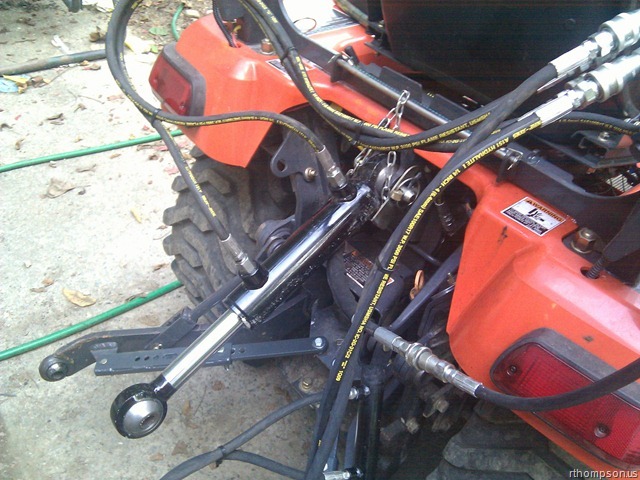 You will need a 1/4 NPT Tee to connect in your return line as well as leaving the stock quick connect in about the same position so you can hook the backhoe back up. The flow is not that great on these tractors but they will do just about anything if you are not in a hurry. The complete setup at the time I posted this is around $500. That is a really good price for what you get considering most ‘kits’ are double that price.